Leo Mac Namara hails from Scariff, Co. Clare, Ireland and for the last fifteen years has lived in Seattle, Washington. He began tin whistle aged five and wooden flute at eight, greatly encouraged by his father Martin. He grew up learning from and playing with such great musicians as P.J. Hayes, Paddy Canny, Martin Rochford, Martin Woods, Martin Hayes and Christy Barry. His playing blends the East Clare style with Sligo/Roscommon flute techniques. He played with fiddler Martin Hayes and harpist Triona Marshall of the Chieftains at the 2013 Masters of Tradition Festival in Ireland. 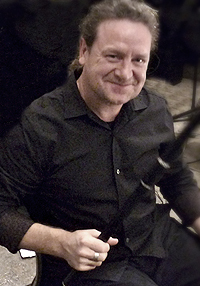 He has performed across the U.S. including at the National Flute Association of America’s annual conventions and the Comhaltas Ceoltóirí Éireann North American Conventions. He has also performed with orchestra. He loves performing and passing on the music to a new generation of musicians.